Description - These beautiful yet durable dance floor tiles are perfect for that special event. Dance tiles are easy to install and require little to no maintenance. They are constructed of a premium wood grain or solid colored vinyl parquet laminate finish attached to a high impact polypropylene co-polymer base. Dance tiles have a easy hook and loop interlocking system that allows you to install a beautiful dance floor in just a few minutes. These dance tiles are completely waterproof and they can be easily cleaned with a mop and common cleaning solutions keeping their beautiful appearence for years to come. Purchase with confidence knowing that these tiles are Made in the USA. Recommended Uses - Dance tiles are used anywhere a modular dance floor is needed. 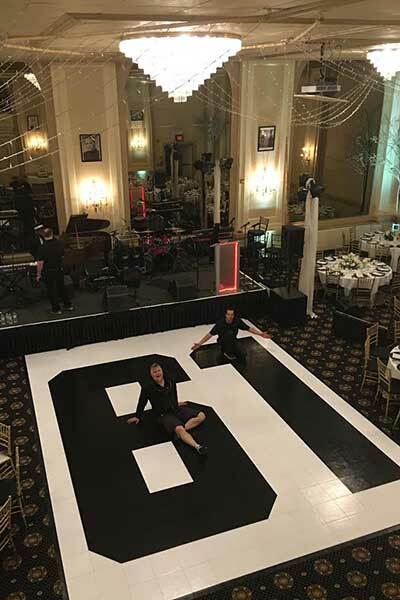 These dance floor tiles have been used both indoors and outdoors for weddings, school dances, tradeshow exhibits, and mulitple other events where a beautiful wood flooring look is desired. Hose off or damp mop the Dance Tiles with a mild soap and water mixture for tough or caked on dirt and/or stains. Note: Since our Dance Tiles feature a vinyl top adhered to the tile with a pressure sensitive adhesive, pressure may be needed to ensure that the vinyl top is fully adhered. You can easily accomplish this by walking across the floor or by using a flooring roller for larger areas. Made with vinyl inserts that have the look and feel of real wood and come in 4 popular colors. 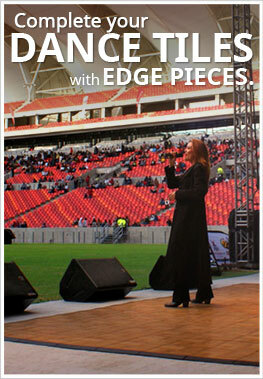 High quality design allows these Dance Tiles to be used on indoor or outdoor ground surfaces. Nice product, works well with our large crowds on the weekends. Had a minor issue which was promptly resolved. We used this to extend our current floor and it worked well!